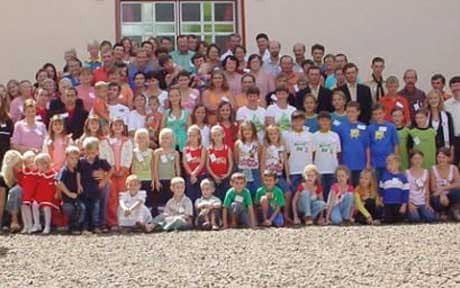 Not a typo: There's a village in Brazil where one out of every five births produces twins, most of them blond-haired and blue-eyed. If you can guess who might have been behind them -- or what experiments may have set the stage for this sort of medical tampering -- you win a cookie. According to a new book, Mengele: the Angel of Death in South America, the head doctor of Auschwitz shuttled himself between German colonies in Paraguay and Brazil, avoiding capture by the authorities until his death in 1979. (There's a pretty intense article about his background and evasion of post-war capture here.) But Angel of Death sheds new light, so to speak, on his Brazilian activities and suggests that he might have succeeded in creating a race of perfect Aryan children. For years scientists have failed to discover why as many as one in five pregnancies in a small Brazilian town have resulted in twins – most of them blond haired and blue eyed. But residents of Candido Godoi now claim that Mengele made repeated visits there in the early 1960s, posing at first as a vet but then offering medical treatment to the women of the town. "There is testimony that he attended women, followed their pregnancies, treated them with new types of drugs and preparations, that he talked of artificial insemination in human beings, and that he continued working with animals, proclaiming that he was capable of getting cows to produce male twins." If you're pregnant, and you're going to a German animal doctor with a shady past for pregnancy advice, Mengele's new biography probably isn't the book for you -- but maybe this one is.